I love Coverflow. I was using it before when it was still a standalone app. 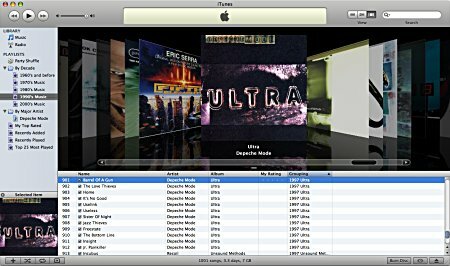 And I’m using it more and more now that it is integrated into iTunes 7. And, as expected, when you use the Coverflow view, the compilation albums appear many times instead of only once. For example, ‘Made in England’ would appear both before and after ‘Exit Planet Dust’. The solution is easy: sort by year then by album name! And when you use Coverflow, you have each album only once! Thanks to codepoet for inspiration. Disclaimer: Backup your songs if you are not confident enough. I’ve spent the past couple days going through my iTunes library trying to make it look nice (I need album artwork for the hundreds of my CDs I ripped — argh). Anyway, I think the correct way to fix this problem is to use iTunes’ “Compilation” setting. Select all those nasty Chemical Bros songs, get info, check the “Compilation” setting and ensure it is set to “Yes”… and click ok. That should take care of it. Unfortunately, the ‘Compilation’ setting and also the ‘Album Artist’ tag have no incidence on the Coverflow “fishy” feature I describe. The only way I’ve been able to solve the problem is to use the technique I mention. Don’t forget that I’m trying to browse my CD collection by year. Does anyone else believe that iTunes would be amuch better jukebox if it had a “Now Playlist List” feature with drag & drop capabilities? I mean like a sidebar, which displays the tracks which have been queued for playback. And you’re able to drag tracks from the library, then drop them in the sidebar to play them next. A similar feature is available in Win Media Player and Real Player, and I find it really handy! What do you think? Yes. That would be handy. But I think that the iTunes designers have ruled out having songs in the left pane. Songs only appear in the central pane. So you are out of luck. What do you think of Coverflow? Do you use it a lot? Fred, just create a new playlist and drag songs in there. Start playing a song from that playlist and any new songs you drag in there will be played in the same order you drag them in. Ehmm thanks for the tip Shane! I have never really used iTunes in the past. But I find Coverflow really appealing indeed, and this may have me use the jukebox more now. I’m still experimenting though, I have a lot of compilations too; and I usually sort my songs by artist. I use MediaMonkey for my mp3 collection on Windows and Amarok, of course, on Linux. What about for PC users. I have the same problem with the secondary sort which to me is very annoying. 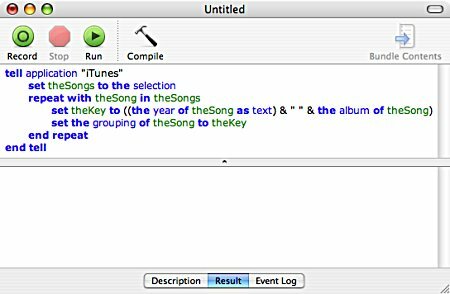 Since we don’t have applescript is there a way to do this on the PC version of iTunes? Thanks! YAOTiR…Yet Another Off Topic iTunes Reply!! Too bad, further development is now compromised due to copyright issues…the music labels have scared the author of this great little app…Hope he decides to update it!